The FeaturePhone 175 is a revolutionary system for recording telephone calls. This unique telephone is designed to record 175 hours of high quality calls onto an ordinary CD recordable. The FeaturePhone 175 utilizes a variety of technological innovations such as ultra flat CD Recorders and sophisticated audio compression. The FeaturePhone 175 operates in the same way as an ordinary telephone with the advantage that all calls are automatically recorded. Never before was it so easy to record and play back your calls. Moreover, the FeaturePhone 175 offers everything you would expect from a telephone: a handsfree function, comprehensive answering machine and an extensive phonebook. The large and clearly lit graphic display provides help with all functions enabling you to actually use the many features provided. It is quite common for companies and agencies to record specific categories of calls. This is important if you want to check any arrangements made or for safety reasons. The centrally located digital installations that record all company calls are often too large for many applications and often overshoot the mark. The FeaturePhone 175 is easier to use if and when required. Notes taken of a business call are seldom complete. It would be ideal to be able to listen to the call afterwards. 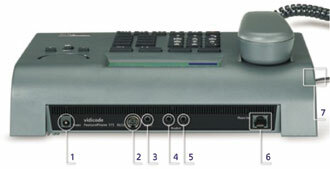 A Call Recorder on your desk is the best solution as all calls are immediately at hand. Users of the Call Recorder say they could never do without one again. Call Recorders are often found at receptions or the telephonist’s desk enabling management to evaluate the call in the case of an incident. A FeaturePhone 175 ensures all calls are automatically recorded at any location. Nowadays everyone is familiar with the advantages of a CD: Reliability and direct access to all recordings. It is clear that the advantages of direct access become even more evident when there are 15,000 calls on one CD. This is why a CD is the ideal storage medium for telephone calls. The capacity of a FeaturePhone CD is so much greater than that of an ordinary CD thanks to advanced audio compression. However, this does not impede the quality of the recordings, as the frequency range of telephones is lower than that of hi-fi stereo music. 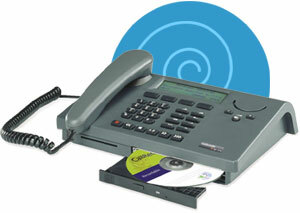 Because a CD can be played on any PC, the CDs of the FeaturePhone 175 can be used by everyone. Also from a cost perspective CDs win hands down from any other storage medium as it is possible to store 175 hours of recordings for the cost of a single CD recordable. The FeaturePhone 175 can be used as an ordinary recorder at any time. It can be used as a dictating device and to record meetings by using the internal microphone, but it can also be connected to a special conference microphone, available as an option, or for that matter to any other microphone or audio source. The FeaturePhone 175 lets you to record several hours for only a small amount of material costs. Think of a FeaturePhone 175 CD as a database. Both the actual telephone and your PC can search the CD quickly using a range of criteria such as telephone number, date, time and duration of a call. The necessary software for your PC is included. Irrespective of the fact whether you use the FeaturePhone 175 or your PC, it will always be very easy for you to find the relevant call quickly. The FeaturePhone 175 is equipped with an IC Card reader. Using the CryptoCard, available as an option, the recordings can be encrypted. Without a corresponding CryptoCard and pin code the encrypted recordings cannot be played back. This is not only a professional way to protect the calls, but is especially useful to protect the privacy of the people involved. PC software is included with your FeaturePhone 175 enabling users to search for specific recordings on the CD. The software provides an overview of the content and offers several further possibilities. The software is suitable for all popular versions of Microsoft Windows including Windows XP. However, it is possible to play back the recordings on any PC without using the software. The recordings on the CD are ideal to send as an attachment with your email.